Mom, the Intern: Venturing out of the newsroom. Venturing out of the newsroom. Yesterday was my first rotation outside of the newsroom. 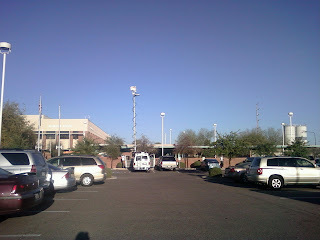 I went out with one of the photographers and a reporter to a story in Chandler. It was actually kind of nice (even though I had to follow behind the live truck) because when the day was over, I was already half-way home! Here's how the story went: Chandler police said a 22-year-old man who was drunk got into an argument with his baby mama and shot at her. She was holding their 7-month-old baby at the time. Luckily, the bullet only grazed the baby's middle finger. The baby is fine; her finger bled, but nothing else happened. The man was, of course, arrested on suspicion of aggravated assault. 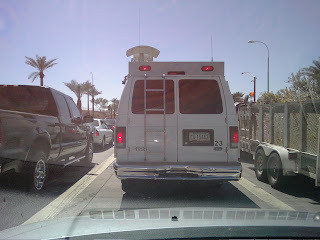 So Greg, Jack and I headed out to Chandler to talk to police and try to talk to the victims. When we arrived at the home, no one was there (except for a barking dog). We went across the street to talk to a neighbor, and that's when the family (minus the father) came home. Of course, they didn't want to talk, but they did answer some questions for us on camera. Baby was fine, mother was fine. The package ended up being great and even included the 911 call. You can read the print version and view the video here. Greg (the reporter) went live at 5:30 and then I drove home. The photog also shot a few stand-ups for me. That was fun! This is what it's like to follow a news van. Good thing they drive slowly. 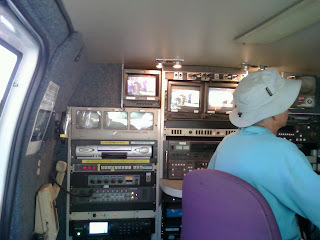 Here's what they look like on the inside -- lots of monitors and buttons. There's the photog, editing the package. We spent a lot of the day in here. Good thing they have a generator so we could run the A/C, or we may have sweated to death in there and died. This one, you'll have to click on to see what I'm talking about. That really tall pole with the squiggly cable wrapping around it like a snake, coming out of the live truck? That's the microwave mast which sends the live signal to the receiver. That thing is outrageously tall. It was a fun but exhausting day. I'm going out again tomorrow, and there's no telling where we'll be. Oh, if you're ever in downtown Chandler and you get hungry, try Guedo's. It looks like a hole-in-the-wall, but it's delicious. And cheap.